EASITax is simply the fastest and easiest way to fill out, print, and electronically file (e-file add on comes at additional cost) 1099 and W2 forms and transmittals. Repeats payer data on each form, fast edit mode, multi-company and multi-copies, prints on IRS standard laser or multi-part forms as well as plain paper. Unlimited payers and unlimited recipients, with EASITax you don't pay more to file more forms. Easily import data from excel files. Export data from EASITax to excel. Easily filter records, print 1 record or all. One button transmittal generation. Converts previous year data each year you upgrade, no need to type recipient and payer information every year. Included formats are: 1099-MISC, 1099-Int, 1099-Div, 1099-R, 1096 Transmittal, W-2, W-3 Transmittal. Users can also add on forms 1098, 1099-S, and 1099-C. This full working shareware version prints "sample" along with all of your normal information on printed output until a registration password is entered. Every other feature is fully functional. EASITax registration is only $89.95. Upgrade each year for only $69.95. We also sell the IRS approved forms for pre-printed form printing at very low prices. 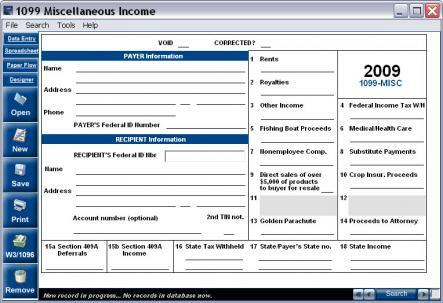 Purchase additional automated IRS forms for only $49.95. Add on Electronic Filing for only $99.95. Come visit us at http://www.1099TaxSoftware.com.